Remember MySpace? People had awful backgrounds, ‘Tom’ was friends with everyone and it was important who you had in your top eight profiles – and how many peoples’ top eight profiles you appeared in. Activity on the page was important as well, with people even requesting comments from others (because the more comments you had the cooler you were, of course). It is also worth mentioning that this self-contained ecosystem was up and running before Mark Zuckerberg had even met the Winklevii, much less turned their kernel of an idea into a $500bn behemoth so ubiquitous that, even without naming it, you know what it is, who founded it and what he looks like. 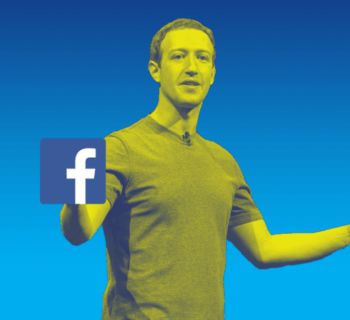 Since the innocent, halcyon days of MySpace, social media has exploded, with Facebook alone having over two billion active users as of April 2018. Then on Instagram there are not only almost one billion users, but things such as self-proclaimed ‘influencers’ (what an awful word) who have 13,000 followers and think people care about the shoes that they wear. Indeed, millennials even consider the quality of their potential Instagram photos above all else as a factor in choosing where to go on holiday. The message is clear and consistent: reputation is currency in today’s world. And now, thanks to Drep Foundation (DREP), reputation is a cryptocurrency. OK, so in English this essentially means that DREP (an amalgam of ‘decentralised reputation’) plan to create a blockchain that records users’ general internet activity (comments, likes, upvotes, downvotes, shares, reviews etc.) and then translates this into a reputation score. Imagine, for example, if writing high-quality, thoughtful reviews on TripAdvisor and Amazon meant that when you commented on Reddit or Facebook, people could look at your reputation score and know that what you had to say was worth listening to. That is one of the things that DREP will enable. 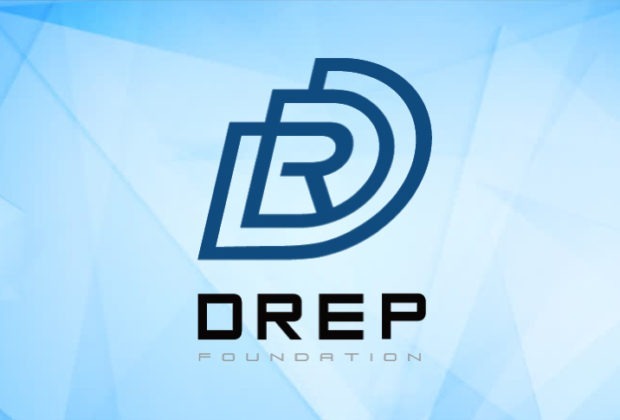 In understanding DREP’s vision, it is important to note that DREP is not a dApp and is instead its own blockchain and infrastructure that will support ‘DRApps’ (decentralised reputation apps), the means by which platforms such as Reddit, Medium, TripAdvisor, Facebook and so on will access DREP’s blockchain. The importance of this is that platforms can create their own DRApps that best suit their platform and, so long as they conform to DREP’s algorithm for calculating reputation value, will still be able to fully access DREP’s ecosystem. DREP’s decentralised reputation ecosystem is comprised of a public blockchain, a reputation-based protocol, and a suite of tools for Internet platforms (DRApps). Let us discuss these in turn. DREP’s whitepaper states that it has developed its own infrastructure out of necessity, which is understandable considering that it is attempting to homogenise reputation in a decentralised manner. One notable feature of DREP’s blockchain is the planned implementation of data sharding in order to combat scalability. In a nutshell, sharding splits each piece of data into multiple fragments and then replicates them on multiple nodes, meaning that transactions can be completed quicker because there are more opportunities [read: nodes] for the transaction to be validated. DREP has also found a way to integrate its reputation-based protocol into the blockchain itself, a move which will streamline processes and improve its efficiency. Whilst that does admittedly remain to be seen, the logic behind such a decision is inescapable: a purpose-built blockchain is obviously going to be more effective than utilising one built for a different, generic purpose. The caveat to that, of course, is that the blockchain is properly created and the quality of DREP’s team is therefore of primary importance (we’ll come back to that later). How DREP calculates reputation is the real value in the project. Without this, DREP is nought but an archival ledger, same as the most banal of blockchains. Luckily, this element has been thoroughly thought out. In the most simplistic terms, this protocol is the mechanism [read: algorithms] that DREP have created to collate likes and reputation from different sources and amalgamate them into a single, consistent value. The aim of this protocol is to increase users’ activity and engagement by rewarding participation, not only through the creation and sharing of content (whether it be ideas or services), but by supporting good content and, for lack of a better phrase, ‘calling out’ poor, fake or malicious content. This is – obviously – related to voting, specifically the upvoting or downvoting of content, users, goods or services. The idea is that when a user votes, they stake a certain amount of their reputation on the basis that their perception is correct and other people will agree with them. For example if the user stakes their entire reputation on a downvote, but more reputation is staked on upvotes, then they will lose their reputation (and conversely, if they are in the majority then they will gain DREP proportionate to the amount they staked). There is also a clever function to prevent DREP whales from manipulating ratings, which DREP have called ‘f’; the explanation involves lots of algebra that we do understand in a logical way without knowing the specific mathematics. We trust it works. However, the whitepaper explains this element in the terms that relate to the content creator, meaning that whomever made the content being voted on will be rewarded for making it. Works the same as voting, except in this scenario it dictates the mechanism through which the voter is rewarded or penalised: should they vote with the majority then they are rewarded, should their vote be in the minority then they lose out. This works the same as tipping on Reddit and other, similar platforms. If you like a piece of content or a product or a service, then you may tip the creator by allocating them a proportion of your DREP tokens. This is where, should a user think that the reputation of something (whether it be a piece of content, or a product, or service etc.) is due to increase, they can stake a piece of their reputation on that happening. If they are right then they are rewarded, if they are wrong then they lose their stake. If a user believes that a user/entity will be upvoted in the long-term –and a majority of voters agree – then they also stand to gain. So, yeah. Simple. But now onto DRApps. DRApps are the interactive layer of DREP. 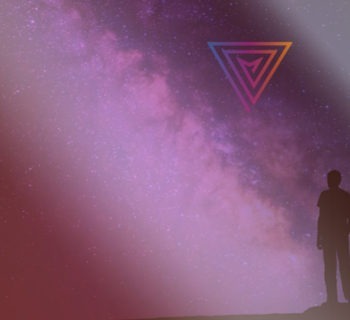 They are the side of DREP's ecosystem that you, or we, or indeed any user of any of the myriad platforms in which DREP hopes to exist, will see and interact with. DREP’s differential is that it doesn’t exist superficially, sitting on top of another blockchain. It is not a plugin. Rather, any platform that is able to incorporate the algorithmic stipulations (i.e. the necessary elements) of DREP will be able to create their own DRApp and, by doing so, access DREP’s ecosystem. That being said, it is again important to note that this does not mean that a platform wishing to utilise DREP will need to put in the hard yards to develop their own algorithm. Indeed, DREP’s whitepaper specifically states that they will produce in-house algorithms for e-commerce, blogs, forums and entertainment (video, music, games, etc.). There are, however – and this may prove to be crucial to DREP’s success and adoption on a wider scale – other means by which DREP can spread and be utilised. Namely, DREP plans to incorporate an open-source library that any potential developer can draw upon when creating a platform-specific DRApp. In practical terms, DREP plan to create and maintain a platform for third parties to not only create their own algorithms, but to share them with other potential developers in an open source library, curated by DREP. The intention being to encourage developers and, therefore, an exponential increase in the number of DRApps. This is a wise move, as the more options for DRApps there are, the easier it will be for other third parties to develop their own DRApps and, consequently, more DRApps and uses of the DREP token. But is there much enthusiasm for DREP’s ecosystem? Let’s look at the general hype surrounding the project. It cannot be denied that DREP has entered the market at a tough time for not only ICOs, but cryptocurrency in general. In recent weeks and months the market cap has decreased – a brief rally to $450bn aside – to a point where it is moving sideways, predominantly around the $240bn-$270bn range. Whilst many doubt such a trend will continue, it is undeniable that the climate into which DREP enters is fraught with uncertainty surrounding crypto’s future trajectory. Regardless of current market trends, DREP has thus far bucked the current, pessimistic trend, standing resolute in the face of market sentiment and providing a highly-regarded – and therefore implicitly solid – investment opportunity: one which has quickly captivated audience, drawing investors’ attention away from the bear market and instead focusing their sights on the much-vaunted bull run that many believe to be imminent. Indeed, in less than a month DREP’s official Telegram group has increased from 4,305 members at the start of June 2018 to an astonishing – and, were it not for the sheer quality of their vision and team, unrealistic – 30,000+ members by the month’s end. This 700% increase speaks volumes for the enthusiasm that an understandably reticent community has for this particular project. It is also an eminently positive sign that activity within the group is equally impressive, averaging 500+ comments from community members on a daily basis. The message is clear: people are interested in DREP. One of the key driving forces of this growth can be attributed to the announcement of DREP’s partnership with Quarkchain on the 31 May of this year. Quarkchain was widely hailed as the investment opportunity of early 2018, a situation reflected in the fact that Quarkchain – and it’s not an overstatement to say this – exploded onto exchanges at 12x its ICO price, thus confirming its position as one of most promising ICOs of 2018. Indeed, DREP shall, in a stark and empirical vindication of its sharding technology, be tasked with helping Quarkchain to solve issues of not only scalability, but also interoperability between different blockchain infrastructures. To reinforce the depth of this partnership, DREP recently welcomed Qi Zhou, Quarkchain’s Founder as an advisor on 21 June 2018. This partnership is important. Whilst the size and activity of DREP’s Telegram channel is impressive, it must be said that the size of DREP’s Reddit community, Twitter account and Facebook followings are comparatively small. DREP has (at time of writing) 1,605 Twitter followers and just 137 Facebook followers. When looking at these numbers. however, we must take into account the fact that DREP has neither an active bounty, airdrop or other associated mechanism to increase the crypto community’s awareness of the project. Let us highlight this: to date, DREP have raised over $12,000,000 without ever employing the traditional mass of people to spread their message. The message is clear: DREP doesn’t need to advertise. Regardless, DREP has been well received by numerous social media ‘influencers’ (as much we despise that word) and, generally speaking, there is both a strong and varied buzz surrounding DREP. With the soft cap being destroyed more emphatically that Serena Williams playing Rafael Nadal on clay, the suggestion is that DREP shall, despite the current bear market, come close to, if not reach its hard cap by the end of the ICO. DREP has a target of $28.7m USD as their hard cap, with contributions pegged to the ETH/USD rate (decided the second day before the crowd sale start date). The crowd sale date will be strategically planned to coincide with the correct market conditions in order to protect the community’s best interests. Tokens cost, intriguingly, $0.011 each (we’re not sure how crucial that additional $0.001 is). With the low token price we would usually expect there to be a high overall supply and DREP have not disappointed, with 10,000,000,000 in total. This is at the high end of the spectrum for cryptocurrencies and means that, similar to the likes of Zilliqa, Digibyte and NEM, the project will need a lot of trading volume to push or decrease the token in value. Beneficially, this reduces the likely volatility of DREP’s price, as a substantial increase in market cap will be required to move the price of the coin. 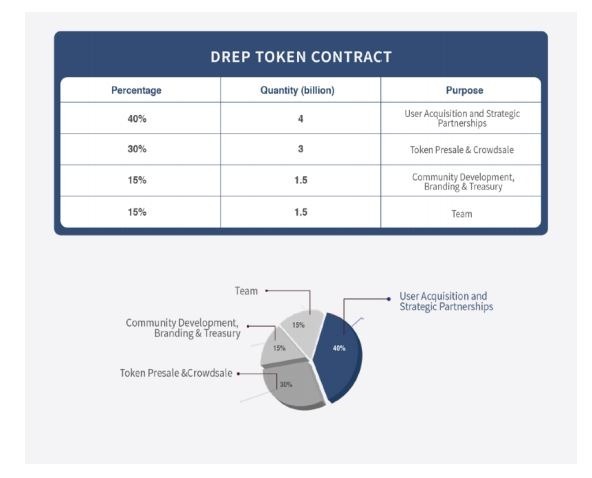 Regarding token distribution, 30% of DREP’s tokens are available to the public during the token sale. 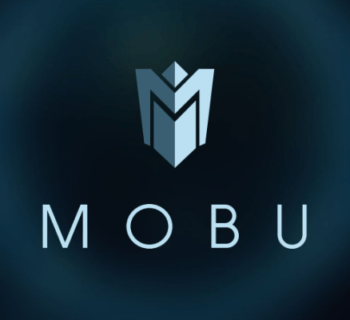 The remaining tokens are split as follows: 40% are allocated to ‘platform promotion’ to be spent on marketing & strategic partnerships; 15% are allocation for community development, operation and administration costs - the remaining 15% of the budget is reserved for the team and early contributors. The team as whole is very impressive, with many members having outstanding blockchain experience, some who have past experience working for some global technology giants and contain some of the best devs in the business. 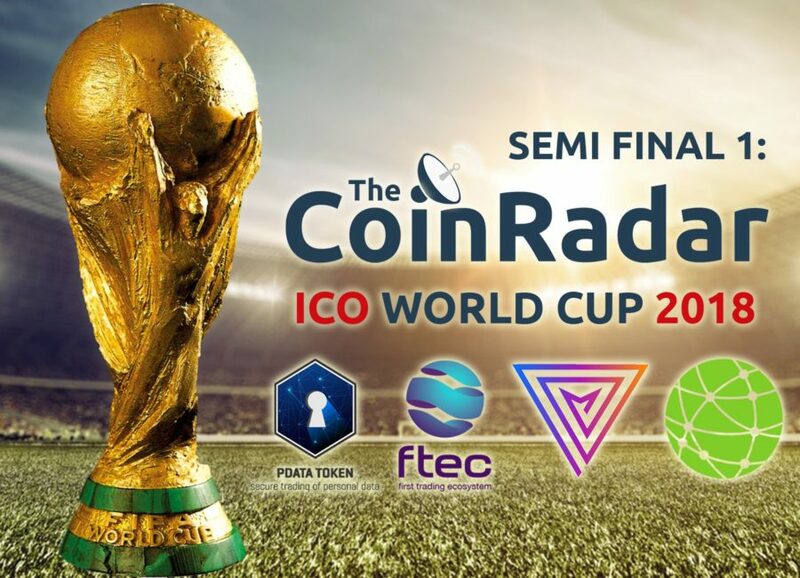 This is one of the most promising teams for an ICO we have come across in a long while and that is not an overstatement. Matt Benice the Co-Founder has had 4 years’ experience as a software Engineer at Google and recently 2 years’ experience at ‘X, the moonsht factory’ a company innovating at the cutting edges of technology. This wealth of experience has meant Matt has spent many of his recent years developing the latest tech for companies who by their nature strive to push boundaries with technology. Lead developer and Co-Founder Stephen Xu is another example of a great asset to this distinguished team. After spending time at Microsoft and Tencent, Stephen has had experience working at QTUM. For those who are not aware QTUM is a highly-respected smart contract-based protocol, founded in March 2017 to help business’ build smart contracts on top of the blockchain, it is an established platform well respected in the blockchain space. 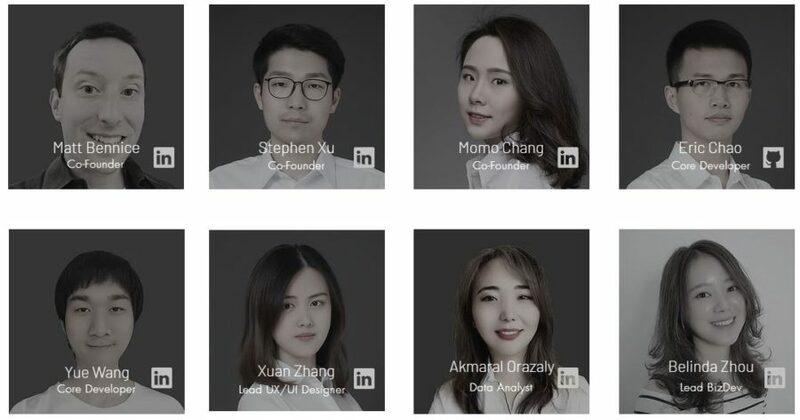 Stephen was not just part of the QTUM dev team, he was the Lead Developer, his experience should prove invaluable to Drep Foundation. The third Co-Founder Momo Chang has valuable expertise in fintech, albeit shorter than her colleagues having only recently completed her Master’s degree from Singapore in 2017. Most recently she has had experience with as a securities analyst for Orient Securities. Eric Chao, core developer for the team also deserves recognition as an expert programmer having won a number of programming contests including the ACM ICPC. The ACM ICPC is considered the Olympics of Programming Competitions so this is an incredibly prestigious accolade. Other team members have impressive experience in high-flying roles within Dubai-centred companies such as Falcon and Associates and Emirates. Finally, the advisors for the team also look strong. Highlights being Ms Lien Siaou Sze, who ranks in the Top 10 of the Fortune’s Top 50 Women in business outside the U.S and the aforementioned Qi Zhou, CEO and Founder of QuarkChain. 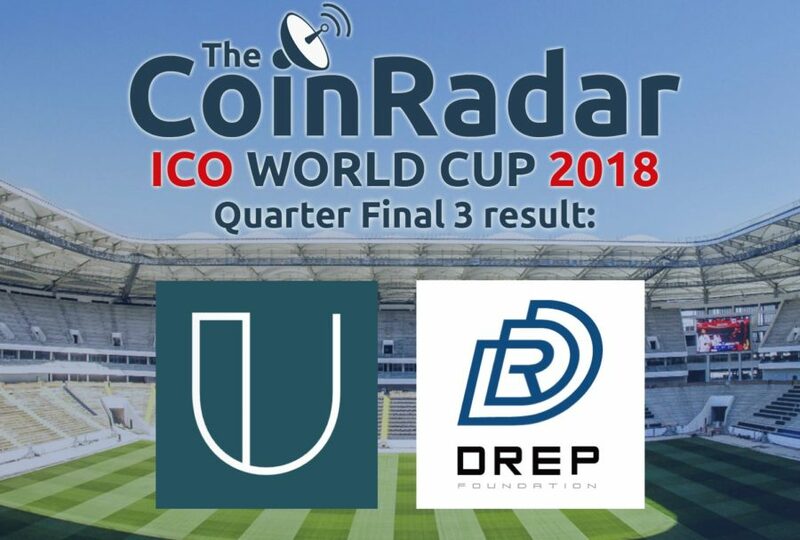 DREP’s idea is ambitious and, should the project manage to actually connect and combine reputation across the entire web then there are no limits to what it can achieve. However, achieving that will take a Facebook, or a Reddit, or TripAdvisor, or Amazon to get on board, and that will be very difficult. However, the proposed blockchain and customisable DRApp possibilities will aid in this. The ability of sites to mould the way they access the DREP chain makes it much more likely that that the network will grow. And then there is the team. The DREP chain will simply never exist and function if the team isn’t up to scratch and it is here that DREP really shines. There are multiple developers with extensive and high-profile experience, and their advisors are also serious people. It is abundantly clear that DREP is taking its mission seriously, and so only a fool would write the project off. The main four use cases of e-commerce, content, social media and entertainment also cover a huge swathe of the internet and so it is difficult to imagine that DREP will ever run out of room to grow. Overall, this is a heavyweight project with a serious and expansive vision. We look forward to watching them strive to achieve it. The team and the sheer scale and ambition of the vision are the real strengths of DREP. Without the team the vision would be fanciful, and without the vision the team would be wasted. Having both means that there is definite potential here. Despite this, DREP does face some monumental challenges. 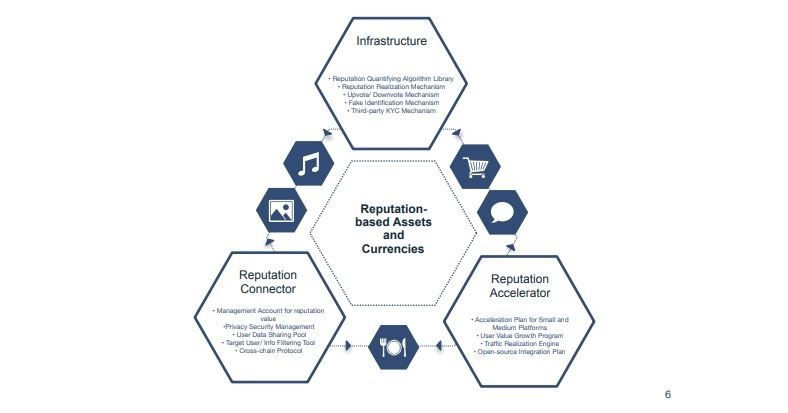 Whilst they do not have direct competitors per se, they will be entering into competition with the in-house reputation services currently operated by many of the platforms they wish to integrate with. This could we be a resistance point for DREP's expansion. Overall, this is a heavyweight project carrying a lot of hype with a serious and expansive vision.